Can I get a credit balance refunded to my bank account? How do I check if I’m due a refund when my account closes? How do I get my refund on a closed account? Why did I get an estimated bill when I submitted a reading just a few days ago? Why was I charged a deposit? I have not received a bill but a payment was taken out - why? I have not received a gas bill, just electricity - why? How do I find out the usage period for this bill? Do I get separate gas and electricity bills? 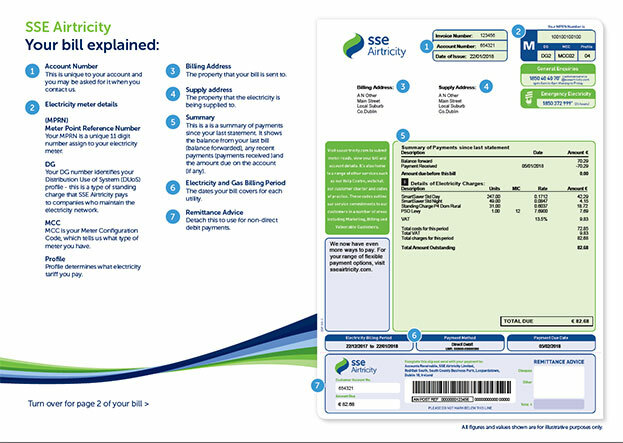 Why are the billing periods different for electricity and gas? Why are there two different rates on my bill? What is the price per unit for day and night rates? When do night rates apply? What is the 'carbon tax'? What does 'Domestic Urban' or 'Domestic Rural' mean? What are the units on my bill? How much VAT am I charged? What other charges might I be billed for? How do I know if my bill is estimated or not? How do I know if this is a bill for gas or electricity or both? Do the bills show meter readings? What is the Conversion Factor and why does it change? Why do you sometimes use estimated meter readings? How much will my next bill be? How do I sign up for or cancel eBilling?